These are the real deal. My Longarm Side Clamps work extremely well and are made to last! They should never wear out or need to be replaced! Each clamp (in the set of two clamps) consists of two wood strips with VERY POWERFUL embedded magnets. The powerful magnets and a friction strip on each wood piece assure that the quilt will be tightly held between them. The clamps are constructed of Black Walnut. Each of the clamps has two 6’ long loop (Velcro-like) straps to hold it to the longarm machine. You need to supply the hook fabric for your machine where you want to attach the clamp if it doesn’t come with this already. Each wood piece of the clamp is very thin and will normally allow the machine to pass unimpeded. The piece that doesn’t have the loop fabric attached is slightly longer than the other piece so that you can easily grab it and pull the two pieces apart. I currently am making three sizes of Longarm Side Clamps. My Small (approximately 10" long) clamp is good for machines that have up to 16” throat space. The Medium (approximately 13”) clamp is for machines that have from over 16” throat space up to about 22” throat space. The Large (approximately 17”) clamp is for throat spaces greater than 22”. That being said, if your backing is too small you can extend your sides by attaching an approximately 6” extension piece of fabric to the top on each side (staple or pin it on) or being sure that the quilt top is wide enough to accommodate your clamp. These lengths will vary a bit. I hand-make each item I sell and, because of the way in which I must make them, there will be a bit of variability in measurement. The variation within a category (Large, Medium, Small) is not an issue as all of the clamps within a category have the same holding power). If you feel that this may be an issue, let me know before you purchase so I can fill your needs. Contact me if you need another size and I’ll quote a price for them. This is by far the most expensive (to me) item that I make and they are also very technical, time consuming, and difficult to construct and this is reflected in the price I have to charge for them. However, you will quickly realize upon using them that they are a bargain! You will never have to replace them and they work much better than any of the other clamps out there on the market. I also offer a refurbishing service for the cost of return postage to you. To use this service, contact me by e-mail and I’ll tell you what you need to do to take advantage of this service. When you send your LSC to me for refurbishing, I’ll make any repairs necessary and refinish the wood to make them as if they were new again. This is a very well-made set and should last way longer than you will be quilting! I spent several months developing this item and offered it for the first time at MQS 2016. They created lots of buzz at my booth and sold out the first day of the show and I had to take orders for the remainder of the show. This has already become my most successful product yet! These are very functional, well-made, designed to last and will be a beautiful addition to your quilting studio! A word about the Black Walnut I use in these clamps. Back Walnut has a magnificent chocolate-brown color that makes it so attractive. It also has light streaks throughout it that add to its interest. Expect both in your clamps! Set of two Large (approximately 17”) Black Walnut Longarm Side Clamps with straps: $78 per set. Set of two Medium (approximately 13") Black Walnut Longarm Side Clamps with straps: $74 per set. Set of two Small (approximately 10”) Black Walnut Longarm Side Clamps with straps: $70 per set. Your machine table needs to have hook fabric attached on the side bars in order to attach your clamps to your table. If yours doesn’t, you can get glue-backed hook fabric (under the brand name of Velcro or others) from a number of places including good hardware stores, JoAnn’s Fabric, Michaels, etc. The purpose of the clamps is to tighten but not stretch the backing fabric of the quilt (a quilt consists of top, batting and backing) so you get a flat surface on which to sew. Your rollers on your table tighten the fabric top to bottom, my Longarm Side Clamps tighten it side to side. My Longarm Side Clamps have strong magnets that will clamp the backing fabric and hold it tightly when you put tension on the clamps with the loop fabric attached to the machine. The Longarm Quilt Clamps you purchased from me consist of two sets (of two) of magnetic bars. Each set of two magnetic bars has a pair of approximately 6' long loop-fabric (like the loop fabric of Velcro) attached to what will be the bottom piece of each set. The other piece (top piece) of your set doesn’t have the loop fabric. Both pieces have a rough friction-piece attached at the clamping surface. This friction-piece is glued in place with a rubber-like glue that helps hold the fabric when you pull on the two loop straps. Each of the 4 pieces of the set has strong magnets that will clamp the fabric between them. The friction-piece and rubber-like glue give the magnets “tooth” to hold your fabric. Your backing fabric will be held by the clamp when you put the fabric between the top and bottom piece of each set. Here is how to prepare your quilt for using the Longarm Side Clamps. Start with the backing fabric. It should ideally be an extra 6-8 inches larger on all four sides than your quilt top. Next the batting should be approximately 4 extra inches larger than your top on all four sides as well. Before applying side clamps to your quilt top sandwich, your quilt top should be basted to your backing and batting. Attach the quilt to the table and get ready to baste the edges. The sides of the quilt top should be secured to all layers with an approximate 1 inch to 1 1/2 inch basting stitch. The top of the quilt top can have a closer stitch but your sides should not as this allows for adjustments of the sides whenever necessary, especially if the quilt top has additional fabric flare related to less than superior piecing. Your side clamps can now be applied to the backing only since all 3 layers are securely attached. 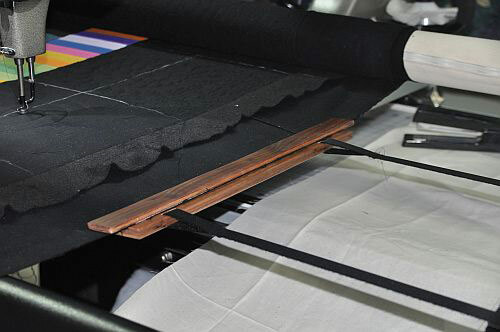 The purpose of your clamps is to make sure the backing does not pleat and to minimize any top bounce. Be sure to not stretch your top as this can have a negative effect on your top appearance and make it appear drawn in when finished and removed from the quilt table. Your side clamps are not meant to make your top stretch as tight as a trampoline. If your clamps are slipping when you pull on the loop fabric, you are pulling it way too much. My clamps are extremely powerful and are designed to grip the backing fabric ONLY. You should be able to tap your quilt sandwich with your hand and have it bounce. The internet is alive with information about longarm side clamps. Google “Longarm Side Clamps” and watch some of the videos associated with them. Be kind to your quilt sandwich and do not stretch it! Let the clamps do their work properly by not stretching the fabric! !